We’d love your help. Let us know what’s wrong with this preview of Icons of Horror and the Supernatural by S.T. Joshi. Horror and the supernatural have fascinated people for centuries, and many of the most central figures appear over and over again. These figures have gained iconic status and continue to hold sway over popular culture and the modern imagination. This book offers extended entries on 24 of the most enduring and significant figures of horror and the supernatural, including Th Horror and the supernatural have fascinated people for centuries, and many of the most central figures appear over and over again. These figures have gained iconic status and continue to hold sway over popular culture and the modern imagination. 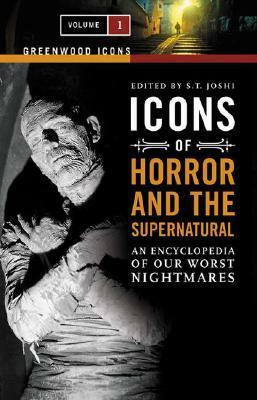 This book offers extended entries on 24 of the most enduring and significant figures of horror and the supernatural, including The Sea Creature, The Witch, The Alien, The Vampire, The Werewolf, The Sorcerer, The Ghost, The Siren, The Mummy, The Devil, and The Zombie. Each entry is written by a leading authority on the subject and discusses the topic's essential features and lasting influence, from the classical epics of Homer to the novels of Stephen King. Entries cite sources for further reading, and the Encyclopedia closes with a selected, general bibliography. Entries include illustrations, sidebars of interesting information, and excerpts from key texts. To ask other readers questions about Icons of Horror and the Supernatural, please sign up. This is a superb introduction to the history of the supernatural in various media. Each article is approximately 12K words long, and many of the contributing authors include lists of seminal works of literature and film for further reading, as well as other more in-depth works of nonfiction for those interested in more detailed analysis. That said, I found some of the selections to be a bit uneven. There were two articles that focused largely on the writings and influence of HP Lovecraft ("The Co This is a superb introduction to the history of the supernatural in various media. Each article is approximately 12K words long, and many of the contributing authors include lists of seminal works of literature and film for further reading, as well as other more in-depth works of nonfiction for those interested in more detailed analysis. That said, I found some of the selections to be a bit uneven. There were two articles that focused largely on the writings and influence of HP Lovecraft ("The Cosmic Horror" and "The Cthulhu Mythos") that were somewhat redundant. "The Haunted House" covered an incredible amount of material, while "The Doppleganger" was so thin on examples and influence that I had no idea how they'd fill 12K words. Rather than focus on psychopaths in general, there was a chapter simply on Serial Killers. There are also some obvious editing errors. But as a whole, the writing is well-organized and accessible, and the most famous monsters are very well represented (vampires, ghosts, ghouls, werewolves, witches, mummies, zombies, etc.). I found "The Angel and the Demon" to be a particularly interesting chapter. I read only a couple of entries, which are detailed enough and very well presented. An interesting tool to begin a research on the literary/cinematic representation of paranormal creatures. Thoroughly enjoyed this book, although it was let down by a couple of inadequate essays, most notably the one on ghost stories, which lacked historical perspective and critical acumen. Sunand Tryambak Joshi (b. 22 June 1958 in Pune, India) is an Indian American literary scholar, and a leading figure in the study of Howard Phillips Lovecraft and other authors. Besides what some critics consider to be the definitive biography of Lovecraft (H. P. Lovecraft: A Life, 1996), Joshi has written about Ambrose Bierce, H. L. Mencken, Lord Dunsany, and M.R. James, and has edited collections Sunand Tryambak Joshi (b. 22 June 1958 in Pune, India) is an Indian American literary scholar, and a leading figure in the study of Howard Phillips Lovecraft and other authors. Besides what some critics consider to be the definitive biography of Lovecraft (H. P. Lovecraft: A Life, 1996), Joshi has written about Ambrose Bierce, H. L. Mencken, Lord Dunsany, and M.R. James, and has edited collections of their works.